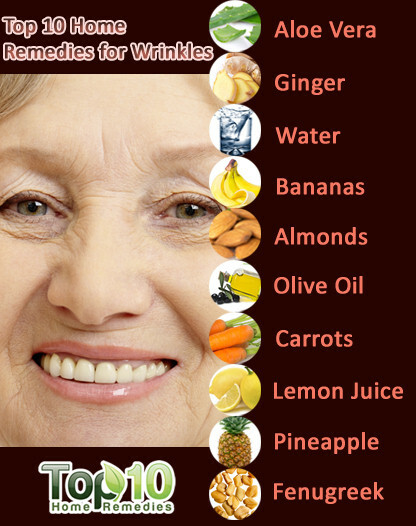 kiss4fashion: Home Remedies for Wrinkles!!! Lemon juice is rich in citric and ascorbic acid (Vitamin C) as they both are known for their skin lightening properties. When the acidic lemons are mixed with the soothing properties of honey, it is a great combination to naturally lighten the look of your skin. Stay out of the sun with any lemon juice products. Directions: Gently massage into the skin and leave on for 20 minutes before washing off. Use every night for 1 month. Be sure to avoid the eyes and use sunscreen when in direct sunlight. If the lemon is too irritating, try adding more honey to the mixture. 2. Plain yogurt contains lactic acid and will aid in exfoliation of the dead skin cells and encourage turnover of skin cells. Yogurt contains natural lipids and minerals. It brings proper cellular nutrition and moisture. You can also add grated cucumber to help tighten pore size. Grate 1/8 cup of cucumber and mix into 1/2 cup of plain yogurt. Directions: Liberally apply yogurt to entire face and leave on for 10 minutes. Rinse with warm water and then splash cool water on face. Use 3-5 nights per week. 3. Cocoa is one of the richest sources of polyphenolic anti-oxidants is. It helps reverse signs of aging by fighting UV induced oxidation. Mix 1/4 cup of cocoa, 3 tablespoons of heavy cream, and 1/4 cup of honey. Lastly, mix in 3 teaspoons of oatmeal powder. Directions: Gently apply thick mask to entire face. After 10 minutes, wash off with warm water. 4. Olive oil and avocados are great natural oils for your skin. Both of these ingredients give your skin a nice drink throughout the night and replenish necessary lipids to smooth your finish. Puree 1 tablespoon of Avocado. Add 2 tablespoons of Olive Oil and 1/2 tsp of lemon juice. Mix well until completely uniform. Directions: Apply a thin layer of lotion to the entire face and leave on the entire night. Rinse off in the morning. 5. Coconut oil is the best natural skin care product for anti wrinkle treatment as it reduces fine lines and wrinkles and tighten sagging skin. Massage your face with coconut oil before going to bed! 6. Use Potatoes for removing blemish marks and dark pigments on the facial skin, you can rub raw potato slices over the area. Place two slices of potato on your eyes for ten minutes, to get rid of crow’s feet and under eye wrinkles. 7. Apply egg white mask to the lines under your eyes to get rid of under eye wrinkles and restore skin elasticity. This homemade skin care remedy is best for natural skin tightening and you will get younger looking skin. 9. Use avocado to your skin care routine to get a younger looking skin naturally. Simply apply either the mash or slices of avocado on your face and you will get that rejuvenated look. The vitamin C present in lemons is a strong antioxidant. Just squeeze out the juice from a lemon, apply and leave on your skin for about 15 minutes every day and then rinse with plain water. OR: Combine 1 teaspoon of lemon juice with half teaspoon of milk cream and 1 teaspoon of egg white. Mix all these ingredients and apply on the face; after 15 minutes, rinse with cold water.Lemon juice with honey is also a very effective remedy for ageing skin because honey has a soothing action. Mix one teaspoon each of lemon juice and honey and massage it into your skin. Keep for 20 minutes and then wash with warm water. Here are some more remedies for ageing skin.